The next day began three and a half hours after we’d arrived. Everyone had to be in the stadium by nine AM, as no more people (even those with tickets) would be allowed in when the graduates started marching. Personally, I’m very glad for the motivation. The opportunity to see military precision at work is an exciting thing, and so requiring that I be on time to see any of it (especially since then I’ll get all of it) is a good thing by me. Except of course for the fact that I wound up running on about three hours of sleep. Our seats were up in the nosebleeds, facing east, in the morning, on a surprisingly hot day. One of Rachel’s (our graduate) cousins passed out from the sun; I and Rachel’s twin’s boyfriend both made multiple water bottle refill runs for the whole group. I alone drank probably three sixteen-ounce bottles, but we’d each only been allowed to bring one into the stadium. I was still dehydrated for days. After the graduates sat down (facing away from us), the flat tops of their uniform hats formed what looked like a platform, shoulder to shoulder as they were. The illusion held for the bulk of the proceedings, as everyone on those benches sat unbelievably still despite their dark gray wool coats and hats. I wouldn’t have been able to sit still even if it’d been a more comfortable day. Graduation ceremonies can be difficult when you’re not one of the graduates. As a graduate, the keynote speaker is there for you, to talk to you, and not the people in the audience. Then you watch your friends get their diplomas and wait to get yours. This was a special ceremony, though; the premier leadership education institution in the United States of America was recognizing these few as worthy of their name. The keynote speaker was the incumbent Chairman of the Joint Chiefs of Staff—the highest ranking military officer in the United States Armed Forces. General Joseph Dunford made sure the graduates understood this recognition for the blessing and the burden that it will remain. He charged them with the notion that, despite the natural feelings of finality inherent in a graduation, this was only the beginning of their careers. He placed them in a league with such figures as President Eisenhower, General Patton, and Lieutenant General Robert Caslen (the current superintendent of the USMA). That seems like a lot of pressure, but I get the feeling West Point breeds a tendency to thrive under pressure in its graduates. My dad, sitting in front of us, was the next one to find her, at Megan’s direction. Once he did, it was only a matter of time before the rest of us succeeded as well. I’d basically gotten there when it was her row’s turn to rise, and when we saw her in profile, there were no more questions. Of course, we didn’t know if Megan was definitely correct until Rachel’s name was called, but she was. The graduation ceremony itself was only the beginning of our ceremonial recognition of Rachel’s achievement, however, and up next we’ll attend two smaller ceremonies that each graduate had the opportunity to opt into. 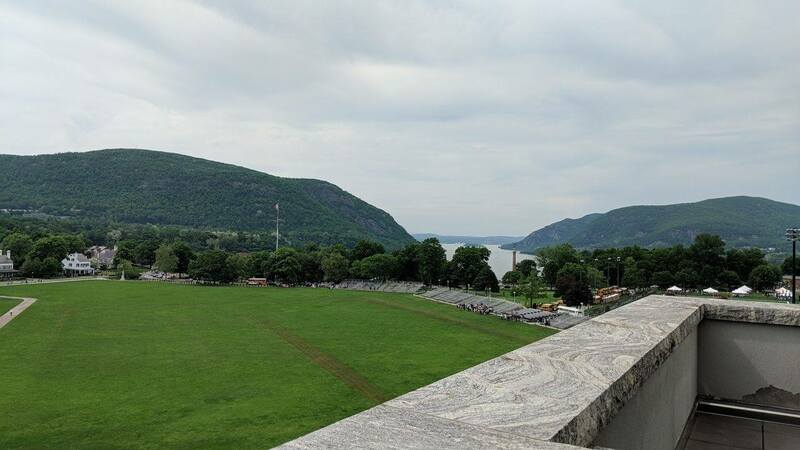 Rachel chose a Christian Fellowship commission in the old stone chapel and a First Salute on the balcony of the West Point Library. You've stumbled upon a collection of stories and the like about the things to do (or that I've done) in the places I've been in recent months. Feel free to browse, and please enjoy.